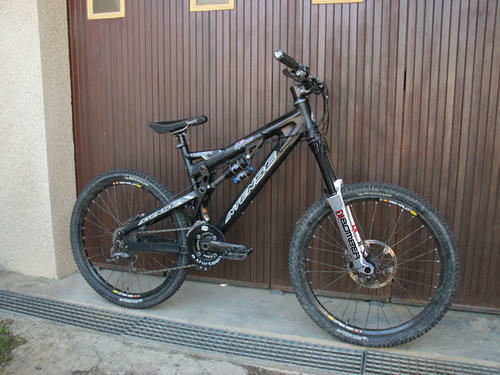 Discussion in 'Downhill & Freeride' started by zmtber, Aug 28, 2005.
i friend is trying to find the best complet bike for the above things that is in the same price range of the VP-free, or cheaper. he has an iron horse sgs expert and not only does it not fit him but it is just not a good bike. he is around 6-4 and i believe if the bike is in reaqlly good condition he would buy used ( i think he likes to ride bikes a little samll so it is more jumpable. thanks for your help because i cant find anything that he would want. I hear good things about the Iron Horse 7point. And the new Bighit looks good. I rode one for over a year and it was a great bike for jumps, drops, and racing. its basicly the same a vp-free. If you really plan on a lot of DH, get the VP-Free, but if you are mainly going for FR and not as fast DH, get the VPX. The VPX has a little less travel, and the geometery is slightly different. If you have enough for a VP-Free, get a VP-Free or a VPX. Iron horse 7points are really nice jumpers. Even the sgs 's are nice. I heard that the DHX Air shocks feel wacky on VPP frames. Any truth to this? I am lovin my 7point7 for all types of riding. Tech Shore style to full speed Whistler runs. I've dj'ep on it and taken it on long xc rides here in Squamish. Most versatile bike I have ever owned. Cant say enough good things about it. If the distribution gets sorted it will be very popular up here in the NW. The new big hit looks like it has a huge wheelbase. He shouldn't. They're excellent bikes with amazing value. I first saw the new Bighit being ridden by a guy from Norcal at Whistler who got top 10 in Pro Garbanzo DH. I'd tell your friend to take a closer look at Specialized. He'd save a lot of money over a Santa Cruz or Intense. Intenseman: Is that a '06 66? 170mm? Can you give me the axle to crown measurement? okay z man the reason your friend is having probs with his sgs is because it doesnt fit him man. i ride the team dh and i can huck, dh, and jump with that thing 5 ways to sunday. hmm what a coincidence. i love the bike and it has been good to me i have beet the living snot outa the thing and it keeps comming back for more. i also have two other friends who ride them and they are loving them. also one of them runs a small frame and hes 6'1", how he does it i dont know, but it works. i think your friend is just over reacting cause its and iron horse and its not as mainstream as everything else, and has he giving you much of a reason he doesnt like specialized. cause i do remember that specialized does have the demo 9 and 8. i mean he could just being saying that and i mean he could know alot thats the what im taking from it. ohh i recomend the vp free, or the 7 point. im not a big fan of uzzies for the simple reason of the tall bb and it makes you set to far foward. unless they have fixed this problem the i say go for either the uzzi or the 7 point.